Enter the ScanSnap iX500. Where other scanners offer a flatbed approach which takes up a lot of space, the iX500 starts off as a relatively small shell. This compact shape means that it takes up much less space than a conventional scanner. 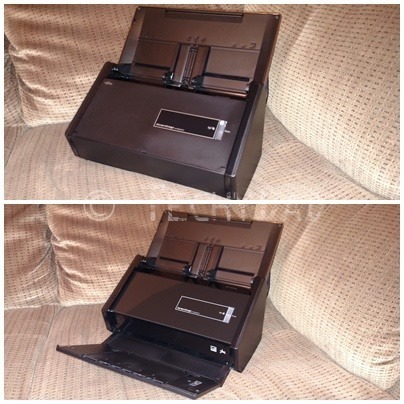 When you need to use the scanner, however, the scanner’s shell unfolds until the full scanner is revealed. When I showed this to my boys, they exclaimed that it’s a transformer and it sure is. Another annoyance about some scanners is that you need to hook your computer up to them with a cord. Sure, USB cords are handy and pretty standardized, but they are still cords. The iX500 takes a wireless approach. After an initial corded setup, during which the iX500 obtains your network’s wireless credentials, the iX500 can be accessed from the wireless network without any cord connecting the scanner and the computer. In fact, you can use an iOS or Android app to wirelessly scan to your mobile phone or tablet. You can even edit the resulting PDFs to delete pages or rotate pages (for example, if you accidentally put the paper in upside down). As with anything on a mobile device, the resulting file can easily be shared with some other app or service. You can quickly attach the PDF to an e-mail, upload them to a cloud server, or just open them for reading. 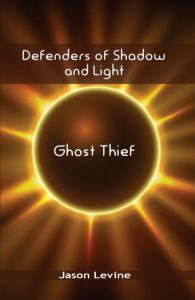 The generated PDFs are nice quality also. Here’s a recipe that I scanned in for Bon Bon Cookies. 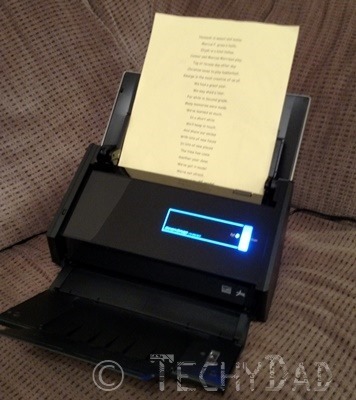 Finally, the scanner’s feeder setup means that you can load in a small stack of papers and have the scanner pull them through one at a time until all of them are scanned. This winds up being much simpler and quicker than replacing papers on a flatbed scanner. As I mentioned before, my boys were amazed when they saw the scanner transform. Once they saw the little blue "Scan" icon on my phone, though, they were itching to scan something. They grabbed artwork that they had made, award certificates that they earned, and more. One by one, they fed them into the scanner and presses the scan button on my phone. One by one, the papers came out and the PDFs appeared on my phone. Eventually, I had to stop them due to a combination of running out of papers to scan and a bedtime that had passed. I’ve shied away from scanning in the past due to the time it took to boot my computer, hook up the scanner, and hope it all worked. With the ScanSnap, however, all I need to do is flip open the shell, place in the paper, and use my mobile device to scan in the document. Quick. Easy. And doesn’t take up much room. 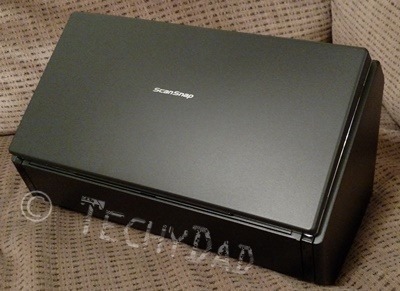 The ScanSnap definitely is a scanner that will be getting plenty of use.